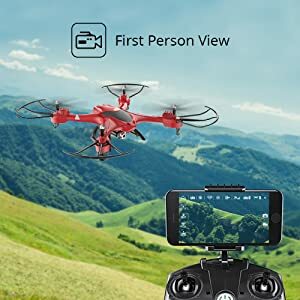 FPV: Pairing your RC drone with your iOS or Android smart phone lets stream a live video and/or photo feed while flying! 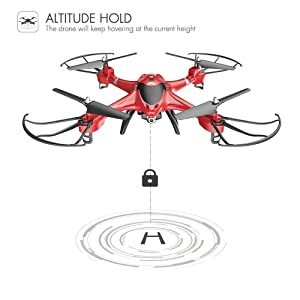 Altitude Hold Function: When you release the throttle stick, the drone will maintain altitude. Kindly be advised that the camera footage will be affected by the shake of the drone during the flight. This drone is Not quite Wind-Resistant. Please fly when wind is minimum. Gyro may get messed up with Magnetic Field Effect on the way when it is shipped to Amazon Fullfiment Center. Please do re-calibration as manual before first flight. FPV is short for the First Person View. 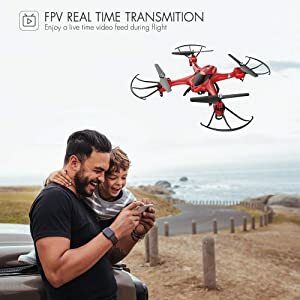 It is a wireless transmission device that is added to the remote control aerial model. All the real time view can be seen through the screen on the ground. It provides real-word experiences and more excitement to players. Usually, the forward direction of a flying multi-rotor is the same as the nose direction. In headless mode, the forward direction has nothing to do with nose direction, the direction will be the same as your transmitter. Take control quickly and easily with one key takeoff and landing, perfect for beginners. It also built with One Key Return Home function, the drone would be able to fly back to the direction of the transmitter. 2. Place the drone on a flat ground surface. 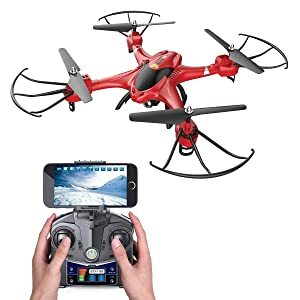 3.Turn on the drone then turn on the controller, push the left joy-stick up and down quickly to pair the drone until the lights on the remote control are solid and the lights on the drone turn solid. 4. Now the drone is communicated with success. 5. Long press “one key return” button to re calibrate your drone. 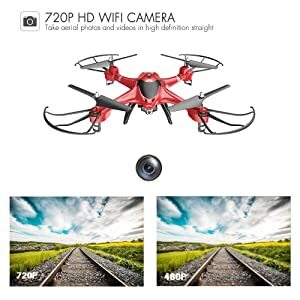 When you re calibrate it successfully, you would see the lights on the drone flash about 2 seconds and and it will flash slowly again. 2. Download the APP by scanning the QR code in the manual. 4. Once WIFI is successfully connected, open the APP. To see real time images from the drone; please press the play button in the APP. Under One Key Return Function, the quadcopter will return along the direction where the tail of the quad-copter pointed to where it was paired to the remote.When flying, the flier should not move around.That said, we suggest pilot to stay stationary and face the same direction in which he set the head of the quadcopter to face when binding the remote.Note：1.The pilot should stay stationary during flights.2. The drone will not stop by itself. 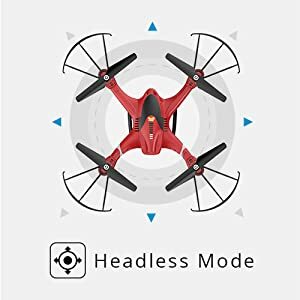 The pilot should stop the drone manually when the drone flies back.3.If a pilot uses the headless mode, please make sure the head of the drone faces forward when the pilot presses down the headless mode button during flight. Otherwise, one key return function could no work well. 1. Motors should be cooled down for 5 minutes between each flight.2. 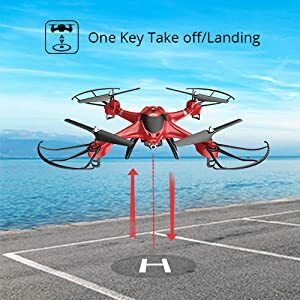 Please make sure that the One-key Landing button is pressed down immediately when the drone hits something and gets stuck so that the motor will not burn out.3. Motors are replaceable and available on Amazon. Instruction video can be found online.